Over spring break, Aidan and took a trip to Calgary to see family and do very little of anything else. (1) We rarely go away on trips together, except for the occasional weekend in Saskatoon where all of our respective parents live, so this was kind of a big deal. This is Aidan waiting on hot turkey sandwiches with me at a Husky House, one of a chain of truck stops that dot western Canada. Husky Houses feel like home. The other thing I was excited about on this trip was our stay at Executive Suites by Roseman. I love hotels. I love hotel beds, I love room service, I love not having to clean my own bathroom, and I love the lack of general life clutter that seems insurmountable at home. If I could live full time in a hotel, I would. I'm even secretly (and now less so secretly) planning on a month in a hotel when I finally sit down to write my first solo book. White towels, quiet, and lobbies for people-watching. Heaven for $3000 a month. I was extra excited about staying at Roseman, though, because the suites at Roseman aren't hotel rooms — they're fully appointed apartments — and I had never stayed in a place like that before. I half expected our two-bedroom to be like your typical hotel room — ugly carpeting and wall-papered walls with bedspreads that matched the art with everything wreaking of nondescript bulk shopping — only with extra space for a kitchen, but it turned out that I was so wrong. Photo credit: Aidan Morgan. This is the view of the living room from the kitchen in our 2-bedroom suite at Executive Suites by Roseman. The place was beautiful. The living room had floor-to-ceiling windows on two sides, and it let out onto a small balcony overlooking a shared outdoor patio below. Photo credit: Aidan Morgan. It was a pretty frigid April weekend, so the patio was largely deserted. I'd love to see this place in warmer weather. Helpful hint: When you're the type that pads around naked at home and you suddenly have walls of windows to which you are not accustomed, people can see you in this living room at night when your lights are on. Either pull the blinds down or put on one of the Roseman-provided comfy robes, conveniently located in the main bedroom's walk-in closet, because Roseman is not a nudist colony. Tsk tsk. Aside from the lovely living room, there were two bedrooms. The master bedroom came with a walk-in closet and its own two-sink bathroom. There was also a main bathroom, an in-suite washer and dryer, and a dining area. And speaking of food, there was a Sunterra Market right downstairs where we bought our groceries, which also had a great restaurant upstairs where we could buy meals made fresh right there. Sunterra's marketing was brilliant, and I know this, because I fell for them immediately and wanted to shop there every day. Come to Regina, Sunterra. Pretty please. 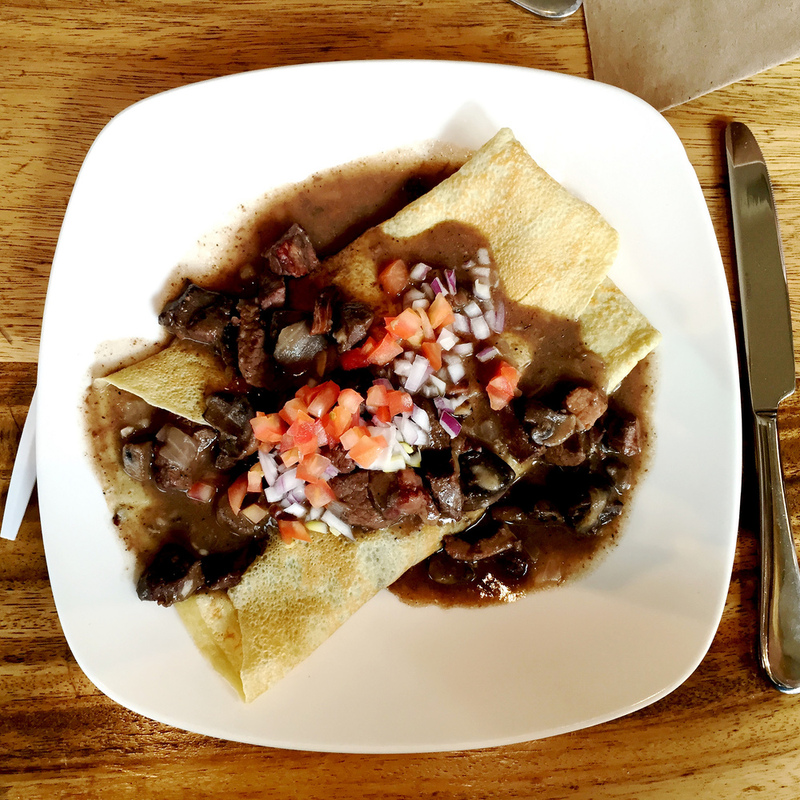 This was moments before I swallowed my burgundy beef crepe whole in Sunterra's restaurant. Within a short walking distance of the Executive Suites by Roseman in Keynote Towers where we stayed, we also found a drugstore, a barbershop, and a great diner that just opened up the week before called The Beltliner. It felt like a good, walkable neighbourhood to spend some time, and I wish we'd had more days to explore its shops. Photo credit: Aidan Morgan. The Executive Suites by Roseman in Keynote Towers are in an area called the Beltline, where there are a lot of little shops, restaurants, and the like. We did eventually venture away from the Roseman/Sunterra block, even though I could have happily holed up there for the entire long weekend. It's a good thing I have Aidan; otherwise, I would just be hermitting in different locations when I travel. It also helped that we had family to visit. We saw my aunt Rachel and uncle Mark and cousins Andrea and Russell, and then we saw my aunt Jill and uncle Jim and cousins Wyatt and Allie and their son Lucas, my first cousin once removed. (4) Everyone fed us pounds and pounds of food, which is how my people show affection and help us build up our true Mennonite form. They fed us so much, in fact, that when we parted ways with Jill and Jim at the end of our visit, we did it with a round of Pepto Bismol shooters so we could bend our fat selves back into the car without too much distress. I broke a belt. I'm not even kidding. It was a cheap one, but still. Still. Time went far too fast, which is how good times almost always go. You arrive at your destination prepared for adventure, and then — BAM — you're back in the car wondering what to name your new extra chin and looking up what the law in Alberta says will happen to you if you refuse to leave your Roseman suite and try to claim squatters' rights. I'm fantasizing about running off with this #LincolnMKC back to @RosemanExSuites in Calgary and squatting there until they crowbar me out. I figured with in-suite laundry and a sweet grocery store downstairs, we could put up a good fight for at least a month. Seriously, Dutchmen Dairy. Hook Saskatchewan up. Aside from doing a lot of nothing, though, I not-so-secretly had my heart set on IKEA, because Saskatchewan has no IKEAs due to our low population and population density, and I love simple, cheap, accessible furniture and meatballs. I may have called it my spiritual home, and I may have said I had edited my life list to include eating IKEA meatballs, especially now that they're horse meat-free. I may have waxed a touch rhapsodic about table lamps. When I was five years old, I announced to my Mennonite mother that I was going to move into my own apartment, get a tattoo, and become a truck driver as soon as I could. I completed two of those three goals 14 years later, but I've yet to hit the road professionally. One can dream. See what I did there when I wrote "cook and eat together"? I made it look like Aidan and I actually did the cooking part together. I feel I should point out that Aidan is an excellent cook, but I am averse to handling food, so the great home cooking was all him. I married well. I'm super proud of myself for figuring out what my first cousins' babies are to me genealogically. I have no idea how this is useful, but it makes me feel smarter. When I called Executive Suites by Roseman, it turned out that I got the owner, Milton Bogoch, on the phone, which was a complete fluke. How great is it that the owner answers the phone? So great. We had not met yet, so I told him who I was and how much I'd liked our recent stay in his suites, and he responded with, and I quote, "Even after all these years, your kind words make my heart sing." I MADE HIS HEART SING, PEOPLE. Milton Bogoch is my Human Of The Day. I'm moving in. This post is about an experience sponsored by Roseman Executive Suites. Although this post is sponsored, it does not contain affiliate links, and all opinions are my own.